Radiotherapy has been used for the treatment of patients with various types of cancer. It is estimated that about 70% of clinical oncology treatments are performed with radiotherapy or a combination of radiotherapy and chemotherapy. Reactive oxygen species produced in radiotherapy induces a variety of DNA lesions, including oxidized base damage, single-strand breaks (SSBs), and double-strand breaks in normal cells. If these lesions remain unrepaired, it may result in cell death through mitotic catastrophe and apoptosis. Radiation may upregulate or downregulate the expression of several repair genes. Changes in the expression of these genes can affect the ability of cells to repair DNA damage. The 8-oxoguanine glycosylase1 (Ogg1), Apex1, and Xrcc1 genes are most important for the repair of free radical-induced DNA damage in BER pathway.,Ogg1 is a DNA repair gene which removes 7,8-dihydro-8-oxodeoxyguanine., Apurinic/apyrimidinic endonuclease (Apex1) plays a role in several biological contexts. Apex1 gene has a key role in BER pathway of DNA damage and transcriptional regulation of several eukaryotic genes. X-ray repair cross-complementing group 1 (Xrcc1) is a DNA repair gene involved in rejoining DNA strand breaks. MLT, a hormone secreted by the pineal gland, not only plays an important role in the regulation of circadian rhythm, but also has an anticancer effect by the stimulation of anti-inflammatory and antioxidative pathways. Due to its amphiphilicity, MLT can be found in any cellular compartment., In addition, several studies suggest that the MLT can be localized inside the nucleus to protect DNA from oxidative damage and promote DNA stability. The main purpose of our study was to assess the effect of radiotherapy on BER pathway gene expression in rat lymphocyte cells and investigate protective properties of MLT through improvement of DNA repair capacity in white blood cells (WBCs). The experimental procedure was in accordance with the guidelines for care and use of laboratory animals as adopted by the Ethics Committee of the School of Allied Medicine, Tehran University of Medical Sciences, Tehran, Iran. Animals were housed in animal facility, with room temperature maintained at 20°C–22°C, relative humidity of 50%–70%, and an airflow rate of 15 exchange/h. Also, a time-controlled system provided 08:00–20:00 h light and 20:00–08:00 h dark cycles. All rats were given standard rodent chow diet and water from sanitized bottle fitted with stopper and sipper tubes. A total of 162 male Wister rats with body weights of 180–200 g were divided into 27 groups using the “simple random sampling method.” The present study was performed in the Research Center of School of Allied Medicine, Tehran University of Medical Sciences, Tehran, Iran. MLT (Sigma Aldrich, USA) at a dose of 100 mg/kg was administered 1 h prior to irradiation to animals by intraperitoneal injection during the designated night period. MLT was first dissolved in a small amount of absolute ethanol and then diluted with phosphate-buffered saline in final ethanol concentration of 5%. Groups 25–27: MLT (100 mg/kg body weight) +8 Gy whole-body X-ray radiation (8, 24, and 48 h). Analysis of the Ogg1, Apex1, and Xrcc1 mRNA expression in WBCs was carried out by quantitative polymerase chain reaction (PCR) after incubation of control and pretreated cells for 8, 24, and 48 h postirradiation. The total cellular RNA was isolated from WBCs. RNA purification was performed by Trizol and the purified samples was isolated using high-pure RNA extraction kit (Gene all, Seoul, South Korea) based on the manufacturer's instructions. Integrity of RNA was evaluated by electrophoresis in ethidium bromide stained in 1% agarose-Tris-borate ethylenediaminetetraacetic acid gels. The result of absorbance ratio of A260 nm/A280 nm was >1.9. For cDNA synthesis, 1 μg of total RNA was denatured at 65°C for 10 min and reverse transcribed for 30 min at 45°C using a cDNA synthesis kit (Gene all, Seoul, South Korea) in a final volume of 20 μl, in the presence of 500 ng of 12–18 primers oligo. Gene Runner software (Version 3.05; Hastings software Inc., Hastings, USA) was used for primer design. All rat primers were designed by Gene Runner software. The sequences of forward and reverse primers were as follows. Ogg1 (NM_030870), forward primer: 5'-CAA CAT TGC TCG CAT CAC TGG-3', reverse primer, 5'-GGC TTT AGC ACT GGC ACA TAC A-3', Apex1(NM_024148), forward primer: 5'-GAT GAA TGC CCG CTC TAA G-3', reverse primer: 5'-GTG TCA CAG TGC TAG GTA A-3', Xrcc1(NM_053435), forward primer: 5'-CCC ATC TGA GAG CCG AAG T-3', reverse primer: 5'-CGT AGG GTG AGT CCT TGC TG-3', and glyceraldehyde-3-phosphate dehydrogenase (Gapdh) (NM_017008) forward primer: 5'-TTC ACC ACC ATG GAG AAG GC-3', reverse primer: 5'-GGC ATG GAC TGT GGT CAT GA-3'. The level of expression of Gapdh gene served as an internal control. The amplification conditions and cycle protocol were applied as follows: 95°C for 2 min for initial denaturation and then 40 cycles of denaturation at 95°C for 15 s, annealing at 60°C for 15 s, and elongation at 72°C for 15 s. We determined the real-time PCR efficiency for target genes and internal control genes with the slope of a linear regression model. Each cDNA sample was bulked and used as the PCR template ranging from 2 to 50 ng. The PCR efficiency of both target and internal control genes was calculated by measuring the threshold cycle (CT) in a specific threshold for a serial dilution of bulked cDNA. Three blood samples were assessed for each group. For each sample, assays were run in triplicate. The comparative 2-ΔΔCT was used to show the relative fold changes in the expression of target genes (Ogg1, Apex1, and Xrcc1) to normalize an endogenous reference (GAPDHgene), a relevant untreated and unirradiated control. ΔΔCT is the difference between the mean ΔCT (treatment group) and mean ΔCT (control group), whereas ΔCT is the difference between the mean CT gene of interest and the mean CT internal control gene in each sample. Each data point represents mean ± standard error of the mean of at least three independent experiments per group. A one-way analysis of variance was performed to compare different groups, followed by Tukey's multiple comparison tests. P < 0.05 was considered to represent a statistically significant difference. As shown in [Figure 1]a, in the irradiation-only group, the expression of Ogg1 was significantly decreased at the initial 8, 24, and 48 h relative to control groups (0.62 ± 0.04 folds, 0.64 ± 0.05 folds, and 0.69 ± 0.17 folds, respectively, P < 0.05). In the vehicle plus irradiation group, the expression of Ogg1 compared to irradiation-only group did not present any significant difference at all time points. However, in the MLT pretreatment group, Ogg1 expression was significantly upregulated in comparison with irradiation-only and vehicle plus irradiation groups at 8, 24, and 48 h postirradiation (3.07 ± 0.09 folds, 3.42 ± 0.13 folds, and 2.3 ± 0.27 folds, respectively, P < 0.05). Additionally, MLT pretreatment with 2 Gy irradiation significantly increased Ogg1 gene expression than 2 Gy irradiation alone in all time points (2.14 ± 0.03 folds, 2.72 ± 0.11 folds, 1.79 ± 0.25 folds, respectively, P < 0.05). Ogg1 expression in MLT pretreatment of 2 Gy irradiation was lower compared to MLT alone group. As shown in [Figure 2]a, also Ogg1 expression in 8 Gy irradiation significantly decreased at the initial 8, 24, and 48 h relative to control groups (0.57 ± 0.05 fold, 0.47 ± 0.2 fold, and 0.38 ± 0.02 fold, respectively). In the vehicle plus irradiation group, the expression of Ogg1 compared to irradiation-only group did not present any significant difference at all time points. Data showed that MLT significantly increased Ogg1 expression after exposed to 8 Gy radiation (1.44 ± 0.23 folds, 1.53 ± 0.06 folds, and 1.38 ± 0.26 folds). As shown in [Figure 1]b, Apex1 gene expression in the irradiation-only group was significantly decreased at the initial 8, 24, and 48 h after radiation in comparison with control group (0.88 ± 0.07 fold, 0.64 ± 0.06 fold, 0.71 ± 0.06 fold, respectively, P < 0.05). In the vehicle plus irradiation group, the expression of Apex1 compared to irradiation-only group did not show significant difference at all time points. In the MLT pretreatment group, Apex1 expression was significantly upregulated in comparison with irradiation-only and vehicle plus irradiation groups at 8, 24, and 48 h postirradiation (2.58 ± 0.09 fold, 3.03 ± 0.12 fold, 1.98 ± 0.26 fold, respectively, P < 0.05). Also, pretreatment with 2 Gy irradiation increases the Apex1 gene expression compared to the 2 Gy irradiation alone in all time points (1.45 ± 0.26 fold, 2.33 ± 0.1 fold, and 1.49 ± 0.19 fold, respectively, P < 0.05). Apex1 expression in MLT pretreatment of MLT with 2 Gy irradiation was lower when compared to the MLT alone group. However, as shown in [Figure 2]b, Apex1 expression in 8 Gy irradiation decreased at the initial 8, 24, and 48 h relative to control groups (0.39 ± 0.09 fold, 0.53 ± 0.08 fold, and 0.32 ± 0.02 fold, respectively). In the vehicle plus irradiation group, the expression of Apex1 compared to irradiation-only group did not present any significant difference at all time points. Data showed that MLT enhances Apex1 expression after exposed to 8 Gy radiation in 8, 24, and 48 h after radiation (0.73 ± 0.17 fold, 0.77 ± 0.05 fold, and 0.6 ± 0.1 fold, respectively). As shown in [Figure 1]c, in 2 Gy irradiation-only group, the expression of Xrcc1 was significantly decreased at the initial 8, 24, and 48 h compared to control group (0.53 ± 0.05 fold, 0.6 ± 0.1 fold, and 0.57 ± 0.15 fold, respectively, P < 0.05). In the vehicle plus irradiation group, the Xrcc1 expression did not show any significant difference at all time points when compared to the irradiation-only group. However, in the MLT pretreatment group, Xrcc1 expression was significantly upregulated in comparison with irradiation-only and vehicle plus irradiation groups at 8, 24, and 48 h postirradiation (1.85 ± 0.19 folds, 2.13 ± 0.2 folds, and 1.68 ± 0.2 folds, respectively, P < 0.05). Moreover, MLT pretreatment with 2 Gy irradiation resulted in more significant increase in Xrcc1 expression than 2 Gy irradiation alone (1.46 ± 0.07 folds, 1.91 ± 0.08 fold, and 1.28 ± 0.14 folds, respectively, P < 0.05). Although theXrcc1 expression in MLT pretreatment with 2 Gy irradiation was lower compared to MLT alone group, it has been shown in [Figure 2]c that Xrcc1 expression in 8 Gy irradiation decreased at the initial 8, 24, and 48 h relative to control groups (0.49 ± 0.1 fold, 0.79 ± 0.25 fold, and 0.51 ± 0.08 fold, respectively). In the vehicle plus irradiation group, the expression of Xrcc1 compared to irradiation-only group did not present any significant difference at all time points. Data showed that MLT enhances Xrcc1 expression after exposed to 8 Gy radiation (0.79 ± 0.12 fold, 0.81 ± 0.04 fold, and 0.75 ± 0.06 fold). BER pathway plays a key role in DNA damage responses and cell survival after exposure to IR. Suppression of different genes involved in this pathway, such as Ogg1, Apex1, and Xrcc1, has been shown to be associated with different cancers.Ogg1, an important repair enzyme involved in the BER pathway, plays an essential role in cell survival and repair of 8-hydroxyguanine in damaged DNA. In addition, Ogg1 and Apex1 have a pivotal role in the simulation of BER pathway. In this study, we investigated whether the exposure to radiation can inhibit the expression of genes involved in BER pathway. Our data suggested that the irradiation suppresses the expression of Ogg1, Apex1, and XRCC1 genes during 8, 24, and 48 h after exposure. As previous studies have shown, the expression of BER pathway genes is dependent on Apex1 and Ogg1., Hence, inhibition of Ogg1 and Apex1 postirradiation can result in suppression of other genes involved in BER pathway. Nitric oxide (NO) produced by IR can inhibit 8-oxodG BER mechanism, resulting in accumulation of DNA damages. Inhibition of BER pathway by NO has been investigated for a homolog of Ogg1 protein. This may be related to a nitrosylation of cysteine residues in the zinc-finger motif of the Ogg1 protein after exposing to NO. The repair failure of 8-oxodG increases the mutagenesis and is expected to promote cancer initiation and progression. Studies shown that mutations of the Ogg1 gene could be associated with several human cancers such as lung, kidney, and gastric cancer. Therefore, stimulation of these genes may facilitate DNA repair capacity and increases cell survival after exposure to IR. In our previous study, we showed that administration of MLT before IR enhances the expression of two HR genes including Cdkn1a and Rad50. However, the exact mechanisms of stimulatory effects of MLT on the expression of DNA damage response genes remain unknown. Some mechanisms such as the scavenging effect of NO and inducible NO synthase gene silencing through inhibiting p52 acetylation may be involved in the upregulation of these genes during the administration of MLT. Upregulation of p53 activity after administration of MLT is another mechanism that may be involved in inducing BER pathway following irradiation. MLT can enhance p53 acetylation through downregulation of murine double minute-2 gene expression. On the other hand, p53 enhances the removal of 8-oxoG during oxidative stress conditions. Furthermore, p53 stimulates BER pathway by interacting with DNA polymerase β and APEX1/REF1. Although the molecular mechanisms of MLT in cancer-related biological pathways are still largely unclear, our data suggest that MLT may contribute to the amelioration of DNA damage and genomic instability in cancer patients who are undergoing radiotherapy. Our data suggest that MLT may participate in the regulation of several key genes involved in DNA damage repair pathways. However, further in vivo and clinical trial studies are needed to clarify DNA repairing mechanism and other properties of this agent. Future investigations might therefore utilize alternative strand break visualization technologies, including phospho-H2AX labeling, to provide conformational evidence, to assess the kinetics of MLT's effect on DNA repair, and to measure the response in specific biological pathways that lead to MLT induction at the protein level. This study was supported by grant number 29964 from the vice chancellor of research at Tehran University of Medical Sciences and Health Services. Ballas LK, Elkin EB, Schrag D, Minsky BD, Bach PB. Radiation therapy facilities in the United States. Int J Radiat Oncol Biol Phys 2006;66:1204-11. Jeggo P, Lavin MF. Cellular radiosensitivity: How much better do we understand it? Int J Radiat Biol 2009;85:1061-81. Valko M, Rhodes CJ, Moncol J, Izakovic M, Mazur M. Free radicals, metals and antioxidants in oxidative stress-induced cancer. Chem Biol Interact 2006;160:1-40. Mohseni M, Mihandoost E, Shirazi A, Sepehrizadeh Z, Bazzaz JT, Ghazi-khansari M, et al. Melatonin may play a role in modulation of bax and bcl-2 expression levels to protect rat peripheral blood lymphocytes from gamma irradiation-induced apoptosis. Mutat Res 2012;738-739:19-27. Najafi M, Shirazi A, Motevaseli E, Rezaeyan AH, Salajegheh A, Rezapoor S, et al. Melatonin as an anti-inflammatory agent in radiotherapy. Inflammopharmacology 2017;25:403-13. Shirazi A, Haddadi GH, Ghazi-Khansari M, Abolhassani F, Mahdavi SR, Eshraghyan MR. Evaluation of melatonin for prevention of radiation myelopathy in irradiated cervical spinal cord. Cell J 2009;11:43-8. Shirazi A, Haddadi G, Minaee B, Sepehrizadeh Z, Mahdavi S, Jaberi E, et al. Evaluation of melatonin for modulation of apoptosis-related genes in irradiated cervical spinal cord. Int J Low Radiat 2010;7:436-45. Chen Y, Kubo E, Sado T, Muto M. Cytogenetic analysis of thymocytes during early stages after irradiation in mice with different susceptibilities to radiation-induced lymphomagenesis. J Radiat Res 1996;37:267-76. Inoue M, Shen GP, Chaudhry MA, Galick H, Blaisdell JO, Wallace SS, et al. Expression of the oxidative base excision repair enzymes is not induced in TK6 human lymphoblastoid cells after low doses of ionizing radiation. Radiat Res 2004;161:409-17. Wallace SS. DNA damages processed by base excision repair: Biological consequences. Int J Radiat Biol 1994;66:579-89. Bjorâs M, Luna L, Johnsen B, Hoff E, Haug T, Rognes T, et al. Opposite base-dependent reactions of a human base excision repair enzyme on DNA containing 7,8-dihydro-8-oxoguanine and abasic sites. EMBO J 1997;16:6314-22. Krokan HE, Bjørås M. Base excision repair. Cold Spring Harb Perspect Biol 2013;5:a012583. Batar B, Guven G, Eroz S, Bese NS, Guven M. Decreased DNA repair gene XRCC1 expression is associated with radiotherapy-induced acute side effects in breast cancer patients. Gene 2016;582:33-7. Jenner TJ, Fulford J, O'Neill P. Contribution of base lesions to radiation-induced clustered DNA damage: Implication for models of radiation response. Radiat Res 2001;156:590-3. Thompson LH, West MG. XRCC1 keeps DNA from getting stranded. Mutat Res 2000;459:1-8. Simonneaux V, Ribelayga C. Generation of the melatonin endocrine message in mammals: A review of the complex regulation of melatonin synthesis by norepinephrine, peptides, and other pineal transmitters. Pharmacol Rev 2003;55:325-95. Tan D, Reiter RJ, Chen LD, Poeggeler B, Manchester LC, Barlow-Walden LR, et al. Both physiological and pharmacological levels of melatonin reduce DNA adduct formation induced by the carcinogen safrole. Carcinogenesis 1994;15:215-8. Vijayalaxmi, Meltz ML, Reiter RJ, Herman TS. Melatonin and protection from genetic damage in blood and bone marrow: Whole-body irradiation studies in mice. J Pineal Res 1999;27:221-5. Jang SS, Kim WD, Park WY. 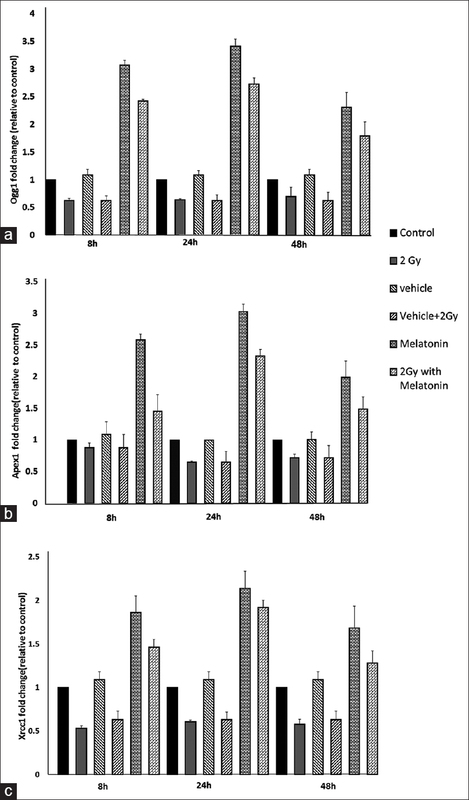 Melatonin exerts differential actions on X-ray radiation-induced apoptosis in normal mice splenocytes and Jurkat leukemia cells. J Pineal Res 2009;47:147-55. Yurtcu E, Guney Y, Ergun MA, Guney HZ, Uluoglu C, Hicsonmez A, et al. 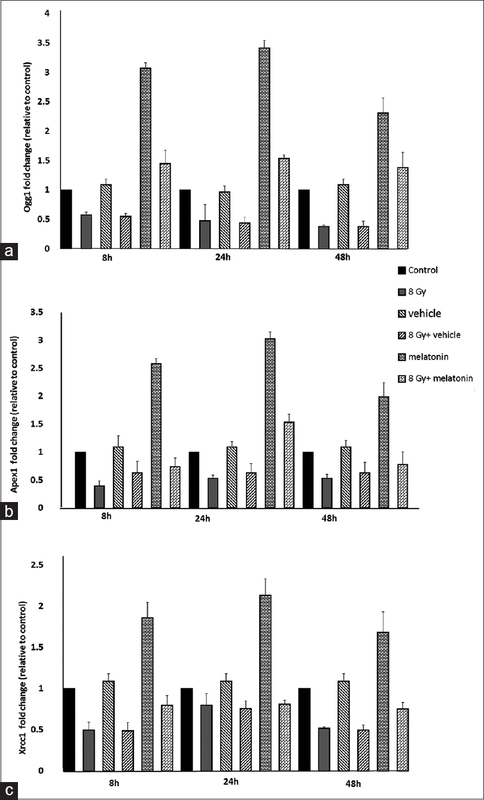 Lack of a time-dependent effect of melatonin on radiation-induced apoptosis in cultured rat lymphocytes. Cell Biol Int 2007;31:1144-9. Reiter RJ, Acuña-Castroviejo D, Tan DX, Burkhardt S. Free radical-mediated molecular damage. Mechanisms for the protective actions of melatonin in the central nervous system. Ann N Y Acad Sci 2001;939:200-15. Hyun JW, Cheon GJ, Kim HS, Lee YS, Choi EY, Yoon BH, et al. Radiation sensitivity depends on OGG1 activity status in human leukemia cell lines. Free Radic Biol Med 2002;32:212-20. Markkanen E, Fischer R, Ledentcova M, Kessler BM, Dianov GL. Cells deficient in base-excision repair reveal cancer hallmarks originating from adjustments to genetic instability. Nucleic Acids Res 2015;43:3667-79. Izumi T, Wiederhold LR, Roy G, Roy R, Jaiswal A, Bhakat KK, et al. Mammalian DNA base excision repair proteins: Their interactions and role in repair of oxidative DNA damage. Toxicology 2003;193:43-65. Brem R, Hall J. XRCC1 is required for DNA single-strand break repair in human cells. Nucleic Acids Res 2005;33:2512-20. Hill JW, Hazra TK, Izumi T, Mitra S. Stimulation of human 8-oxoguanine-DNA glycosylase by AP-endonuclease: Potential coordination of the initial steps in base excision repair. Nucleic Acids Res 2001;29:430-8. Campalans A, Moritz E, Kortulewski T, Biard D, Epe B, Radicella JP, et al. Interaction with OGG1 is required for efficient recruitment of XRCC1 to base excision repair and maintenance of genetic stability after exposure to oxidative stress. Mol Cell Biol 2015;35:1648-58. Wink DA, Laval J. The fpg protein, a DNA repair enzyme, is inhibited by the biomediator nitric oxide in vitro and in vivo. Carcinogenesis 1994;15:2125-9. Shinmura K, Kohno T, Kasai H, Koda K, Sugimura H, Yokota J, et al. Infrequent mutations of the hOGG1 gene, that is involved in the excision of 8-hydroxyguanine in damaged DNA, in human gastric cancer. Jpn J Cancer Res 1998;89:825-8. Tahan G, Gramignoli R, Marongiu F, Aktolga S, Cetinkaya A, Tahan V, et al. Melatonin expresses powerful anti-inflammatory and antioxidant activities resulting in complete improvement of acetic-acid-induced colitis in rats. Dig Dis Sci 2011;56:715-20. Najafi M, Shirazi A, Motevaseli E, Geraily G, Norouzi F, Heidari M, et al. The melatonin immunomodulatory actions in radiotherapy. Biophys Rev 2017;9:139-48. Guha M, Maity P, Choubey V, Mitra K, Reiter RJ, Bandyopadhyay U, et al. Melatonin inhibits free radical-mediated mitochondrial-dependent hepatocyte apoptosis and liver damage induced during malarial infection. J Pineal Res 2007;43:372-81. Sengupta S, Harris CC. P53: Traffic cop at the crossroads of DNA repair and recombination. Nat Rev Mol Cell Biol 2005;6:44-55. Manzella N, Bracci M, Strafella E, Staffolani S, Ciarapica V, Copertaro A, et al. Circadian modulation of 8-oxoguanine DNA damage repair. Sci Rep 2015;5:13752. Valizadeh M, Shirazi A, Izadi P, Tavakkoly Bazzaz J, Rezaeejam H. Expression levels of two DNA repair-related genes under 8 gy ionizing radiation and 100 mg/Kg melatonin delivery in rat peripheral blood. J Biomed Phys Eng 2017;7:27-36. Valizadeh M, Shirazi A, Izadi P, Bazzaz JT, Rezaeejam H, Tabesh GA. Effects of melatonin on repair of DNA double strand breaks caused by ionizing radiation in rat peripheral blood. Biosci Biotechnol Res Commun 2016;9:821-7. Rezaeejam H, Shirazi A, Izadi P, Bazzaz JT, Ghazi-Khansari M, Valizadeh M, et al. Radioprotective Effect of Melatonin on Expression of Cdkn1a and Rad50 Genes in Rat Peripheral Blood; 2017. Available from: http://www.cancerjournal.net. [Epub ahead of print]. Deng WG, Tang ST, Tseng HP, Wu KK. Melatonin suppresses macrophage cyclooxygenase-2 and inducible nitric oxide synthase expression by inhibiting p52 acetylation and binding. Blood 2006;108:518-24. Proietti S, Cucina A, Dobrowolny G, D'Anselmi F, Dinicola S, Masiello MG, et al. Melatonin down-regulates MDM2 gene expression and enhances p53 acetylation in MCF-7 cells. J Pineal Res 2014;57:120-9. Achanta G, Huang P. Role of p53 in sensing oxidative DNA damage in response to reactive oxygen species-generating agents. Cancer Res 2004;64:6233-9.